Have you tried 'battera' before? Keria Japanese Restaurant is the best izakaya (a type of Japanese establishment serving alcohols and food to go along with) I've ever been in Singapore. 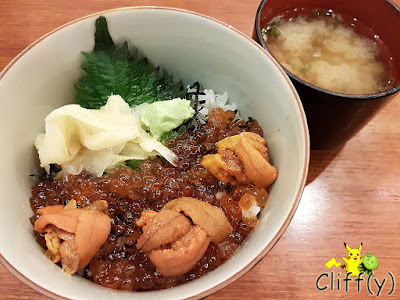 For those who enjoy going for Japanese karaoke at Cuppage Plaza like me, you may want to drop by for a drink or a meal to complete the experience. It really felt as if I was in the Land of the Rising Sun as I interacted with the owner, Seino Hatsuho, and the servers in Japanese. 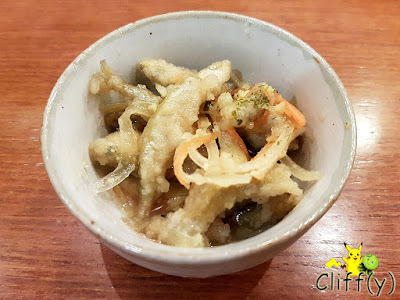 The complimentary appetiser of pickled anchovies tasted amazing with such a perfect sweet and sour balance. I'd certainly love to have more of the salt-water fish. 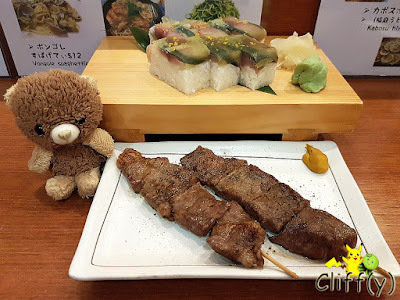 A luxurious snack that went well with umeshu (Japanese plum wine), the beef skewers were almost melt-in-the-mouth tender. They were seasoned with black pepper, going well with a bit of mustard for that extra kick. 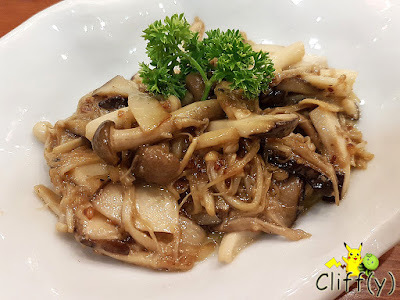 The stir-fried assorted mushrooms dish was executed well. I saw at least four varieties of mushrooms being used, all of which were juicy and earthy. They were evenly coated with butter that made them aromatic. Derived from the Portuguese word bateria (lit. 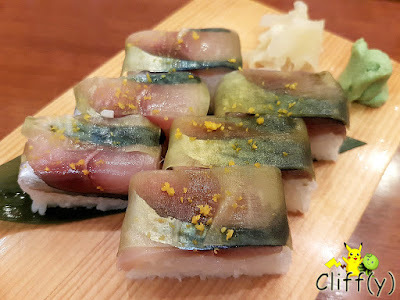 small boat), the boxed cured mackerel sushi served by the restaurant was pretty fresh. Each piece was layered with a vinegared kelp and sprinkled with yuzu (a species of aromatic Asiatic citron) zest that made it fragrant. It's pretty strange that some of the smaller-sized rice dishes aren't available in the regular size. Anyway, the sea urchins were creamy with a nice tang of the sea. The salmon roe were seasoned with soy sauce. Flavourful as they were, I'd prefer them to be more explosive in the mouth. 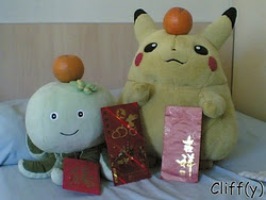 Pika's advice: Do take a look at the extensive menu thoroughly before ordering. 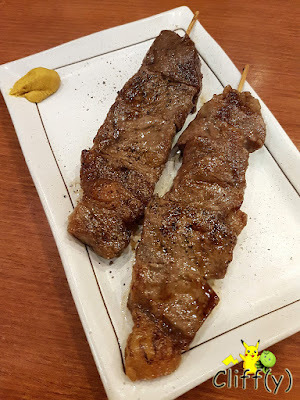 Chances are, you'll need to spend some time deciding what to try for the day as there seems to be too many good things whipped up by the restaurant.